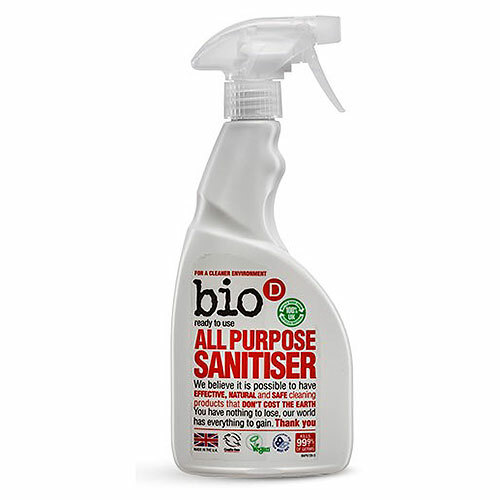 This all purpose sanitiser is tested to BSEN1276 (food grade standard) - it kills 99.9% of harmful bacteria including e-coli and salmonella. Use it in all areas around the home; a fantastic, non-toxic, non-irritant all-rounder. Use it on all hard surfaces - simply spray on and wipe off after 15 seconds using a clean damp cloth. 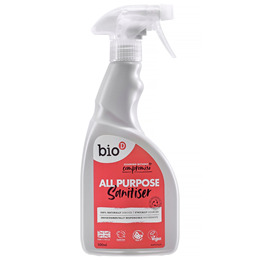 Below are reviews of Bio D All Purpose Sanitiser Spray - 500ml by bodykind customers. If you have tried this product we'd love to hear what you think so please leave a review. Good product. This is our second purchase. HOWEVER, would not recommend using it on laminate flooring as it turns the floor surface in to a skating rink. Haven't yet tried it on unsealed, oiled wooden worktops because manufacturer couldn't say whether or not it was suitable. Will buy this again. Good vegan product with no harsh chemicals. Great product, as it's non toxic i feel much happier using this around the home, and I feel it's safer for pets and people in general. It works brilliantly and i would never return to using harsh chemicals again. Wouldn't be without this - non-toxic and does the job! Love all the BIO products delivered carefully and promptly.Try and avoid anything that is full of chemicals ,so this range is spot on. Love this cleaning spray! It works and smells good too without all the nasties.